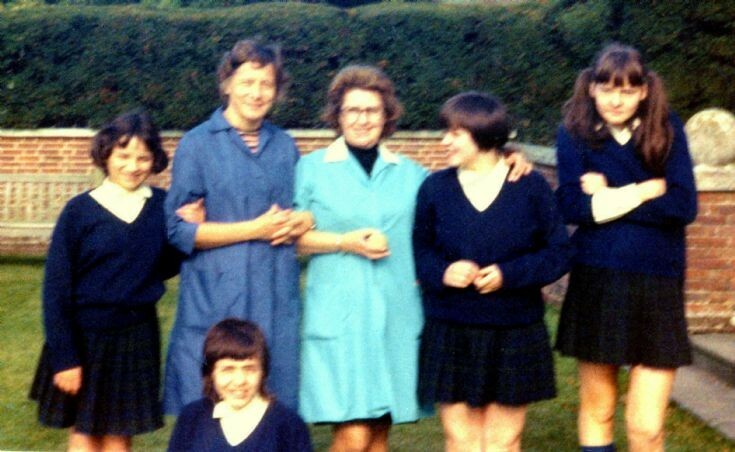 The photograph shows two staff members and four pupils of Ditton Place School. In the pale blue tunic is Mrs Margaret Cook. The Large Version shows eight staff members of the school. Mrs Margaret Cook is in the dark suit. Select Open Document for three images of members of the staff. Mrs Cook appears in the first picture at back right. Please can anyone add more names? I am so glad to come across pictures of your lovely, late, mother and some of her pupils. My sister is a former pupil from Ditton Place and she was so happy to see this photo. She recognises your mother, as do I from the 'open day events' at the boarding school. The pupil at the end, right, was my sister's best friend, Moya, and my sister is Gina. My sister is now 60 and never forgets Ditton Place and the teachers who have made it a really good place for the pupils who had special needs and were oftem homesick. I have noticed in one of the previous pictures of the school there was a picture of Mr. Bertram, the headmaster, who wore glasses. I can't see this picture on here now, but I'm glad I have downloaded it, as I also want to show my sister. I also recognise another teacher on the website, being Miss Roberts who was an Anglo-Indian teacher and who had a lovely dog called 'Cheetah'. She resided in the cottage in Brantridge Lane and one day invited my mother and I in for tea. So, so lovely. Thank you for uploading the pictures and I will check on here from time to time, for any more photos you may have to add.